February is the perfect time for ladder work in Washington. A combination of a gutter than has leaked on our office windowsill since we moved in, and the sounds of animals in our attic finally pushed us over the motivation barrier, and we decided to attack the upper echelons of the house this winter. 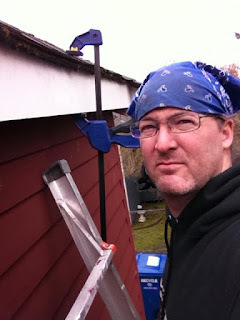 I gleefully ripped off all the craptastic plastic gutters... a good portion of the work having to be completed with a sawzall, due to ridiculous mounting brackets and stripped screws. On the other corner I got a close look at the home of some wee birds who we see hatch every summer. Sadly, I had to evict them in the course of my repairs, but I may put up another house near by for them. At this time I would like to take a brief pause, so that we can all give thanks to The Clamp. It is seriously the smartest tool ever. Way smarter than me, thats for sure. For hundreds of years, this simple tool has been turning 2 and 3 person jobs into tasks that one person can complete on their own, 14 feet in the air, in the rain. Once that was all taken care of, we cleaned out the remaining nesting materials we could find in the attic, and then covered up the vent slats with screens and 10,000 staples. I'm going to hope that now that we are completely prepared for all sorts of deluge, the laws of carwashing on a sunny day are going to apply, and we will get only mild amounts of rain this spring. Just enough to make the garden thrive; not enough to keep me off my motorcycle.